There has been a lot of debate in the Riviera Kitchen on how to achieve the perfect boiled egg. We’ve tried a number of different ways, but found this one (taken from Cooks Illustrated) to have the best outcome. And if you have the time, we highly recommend making your own mayonnaise. The taste difference from fresh mayo to a store bought is unbelievable. One of our favorite mayonnaise recipes in the RK is inspired by a Martha Stewart recipe. Start the eggs in cold water, bring the water to a boil, then remove the pan from the heat and let sit for 15 minutes. Peel the eggs, rinse, dry and cut the cooked eggs in half. Place the whites, cut side up, on a platter. Place the yolks in food processor. Add the mayonnaise, mustard, vinegar and mix well. Season to taste with salt, pepper and cayenne. Place into a pastry bag (or zip lock with the corner cut) and pipe into each egg half. 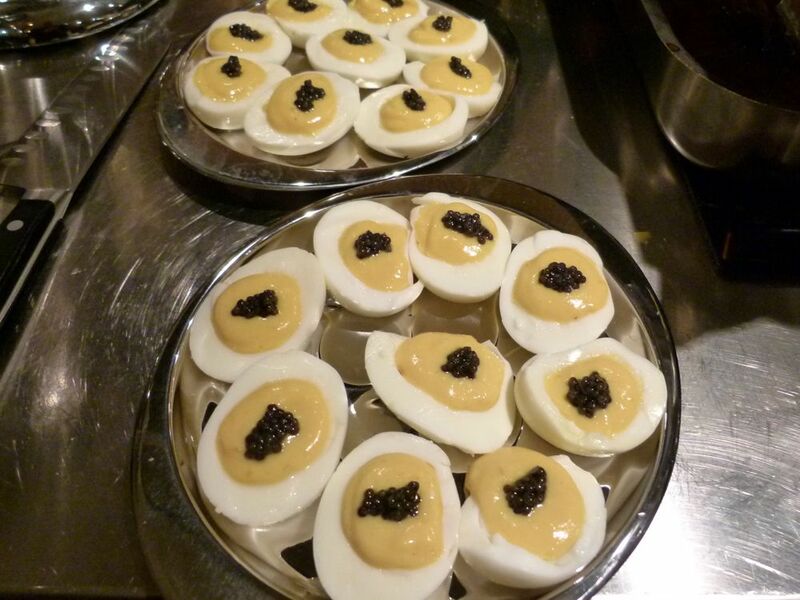 Top with 1/4 teaspoon caviar. Thank you for the inspiration Joshua!